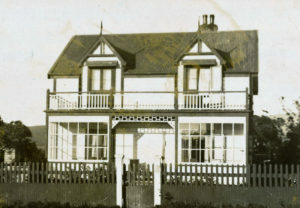 Built as a holiday home in the late 1890s, this property became a boarding house, a second Plimmerton House, from 1915 to 1938. Later uses included a doctor’s surgery, a greengrocery, a bakery, and flats. It became a private residence again in 1984. David Thomson Stuart and his wife Millicent bought this section at the second Plimmerton land auction sale in 1896. David Stuart was a prominent Wellington accountant and businessman, and the couple built the house as a holiday home. It has undergone many changes of use over the years but, as can be seen from the photographs, the street view is still of, essentially, the same building, with the same roofline and external profile as 120 years ago. From 1915, it was a boarding house known as Plimmerton House and run by Miss Eliza Vaughan, previously the proprietress at Erenora, 7 Steyne Ave. Miss Vaughan continued advertising rooms until at least 1938. This is the second accommodation building called Plimmerton House, not to be confused with the much larger building, further south along Steyne Ave, which was built in 1894 and destroyed by fire in 1906. Since the 1940s, it has been run as a guesthouse and flats, with rooms also used by the council and as a doctor’s surgery. A manchester shop traded here and later a bakery and cake shop occupied the ground floor with a greengrocer next door fronting School Road. The Pope family lived here for about 17 years, from 1954, but most other occupiers stayed for shorter terms of only a few years. In 1984, it resumed its original function as a private residence. The current owners added the adjacent section in School Road to the property.